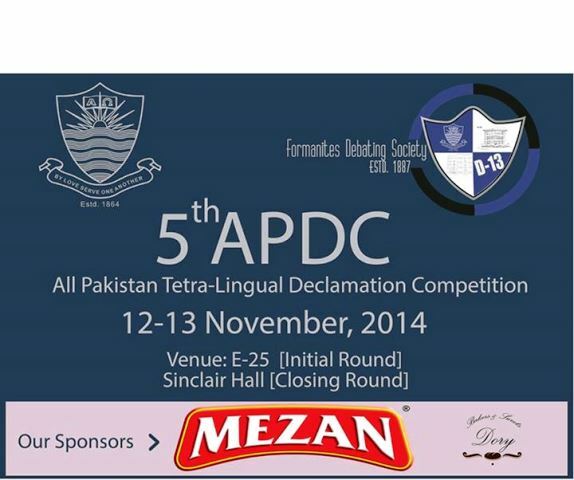 The Formanites Debating Society is proud to hold the All Pakistan Tetra Lingual Declamation Competition on 12 and 13 November 2014. APDC has become one of the most awaited and prestigious tournaments of the year annually hosting hundreds of teams from all over Pakistan. FDS is the oldest Debating Society in Asia (established in 1887) and FCC is one the best institutions in Pakistan, recently just having celebrated its sesquicentennial anniversary. Join us as we write history! The initial round will be held in E-25 from 8:00 am to 9:00 pm on 12 November 2014 and the Pushto and Punjabi Rounds on 13 November 2014 from 9:00 am to 2:00 pm in E-25. The Final will be held on 13 November 2014 in Sinclair Hall from 2:00 pm to 4:00 pm.